'We built a cairn, put up our poor slighted Union Jack, and photographed ourselves - mightly cold work all of it... Well, we have turned our back now on the goal of our amnition and must face our 800 miles of solid dragging - and goodbye to most of the day-dreams!' (Scott's Last Expedition  vol.I, p.536). The image was offered as a supplementary photograph at the Fine Art Society Exhibition of Ponting's photographs of the British Antarctic Expedition: 'It was felt that a selection of the photographs taken by Lieutenant Bowers at the South Pole must be included, for they are without doubt the most tragically interesting in existence. The films from which they are made were brought back by Captain Scott as evidence of what he had found and accomplished, to the final camp where he and his two surviving comrades died, and they lay beside the dead body of the leader for eight months before they were found. They were developed a month later in the hut at Cape Evans... 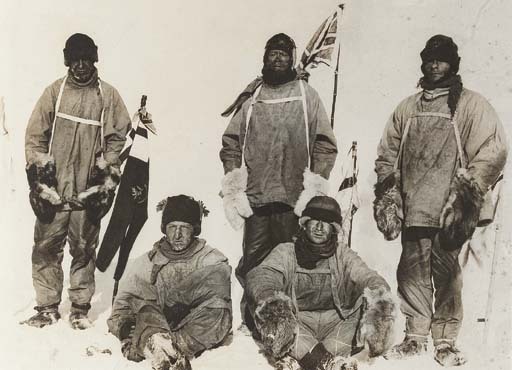 This historic picture, showing Captain Scott and his four comrades at the Pole, was...taken by Lieutenant Bowers, who obtained the photograph by means of a string attached to the camera. He is seen in the act of pulling it... The flags are light silk sledging flags which each member of the Expedition carried, and which bore a crest or some individual device' (Fine Art Society. The British Antarctic Expedition 1910-1913, Exhibition of the photographic Pictures of... Ponting , pp.23-24).